BESM d20 is one of today’s best-selling d20 System games, and this Revised Edition expands and updates the game for the d20 System v3.5! Additionally, it incorporates the complete mecha creation system from d20 Mecha. 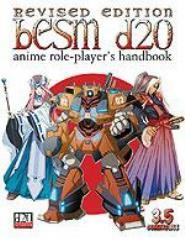 Inspired by the dynamic settings and stories found in a wide range of anime shows, BESM d20 allowing players to create characters from any genre or sub-genre. Comedy or horror, fantasy or science fiction, mecha action or passionate romance...if you can imagine it, you can play it. New character classes: including magical girl, mecha pilot, pet monster trainer, and a dozen more. New skills, new feats, an exhaustive point-based attribute list, and a detailed cost assignment for the core 3.5 Edition fantasy races and classes. Everything you’ve always wanted from your fantasy RPG -- and more!